If you’re a dog-owner who has a hyper or disobedient pet, there is no need to fear. It’s easier than you may think to teach a dog basic commands, including how to heel. The internet is full of valuable information about how to care for our pets. No matter what command you teach your dog, the key ingredients are reward and consistency. A reward is necessary so that the dog will have incentive to obey, and consistency is essential because they will become confused by instructions that change all the time. Dog training is a fun aspect of owning a dog. You might be a busy dog-owner who feels that you don’t have enough time to dedicate to regular training, but owning a dog is a commitment, so you need to see it as such. 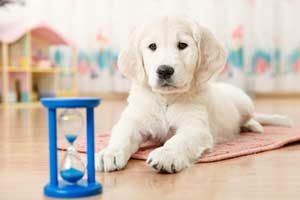 Putting in time to teach your dog good behaviors like crate training or how to “stay” early on can be a wise investment that saves you time, frustration, and money down the road. We always make sure to squeeze in an episode of our favorite TV show into our busy routine, so we can manage to make room for half an hour of training every day. There are many benefits to training your dog. For one, dog training can save a dog’s life. The more you use your voice and authority to train a dog, the more it will listen to you. This can be very useful if and when dangerous scenarios occur. Is there a busy road near your house? Do you allow your dog to roam around the front garden without a leash? If the garden isn’t fenced in, it isn’t recommended to do this unless you’re confident about your dog’s obedience. Whatever the case, it is much more likely that a trained dog will be better equipped to deal with unforeseen circumstances than untrained ones. Dog safety is one of many reasons to train a dog properly. The more time you spend with your dog, the more you bond with it. The process of bonding with your dog begins the moment you bring them into your home, but a dog that is left to its own devices will not be as attached to you or your family members as a dog that receives plentiful attention and training instructions. Plus, there’s the adding advantage that you can bring a trained dog to more places, and can feel more at ease in social situation that includes other dogs. Successful training can also mean that you feel more comfortable taking them off the leash so they can have a higher degree of freedom and enjoy the sights and smells of a new environment more readily. It is evident that dog training is highly beneficial for both you and your dog. Not only does it help secure the safety of your dog and strengthen the bond between you, it also helps you to understand your dog. A dog uses a variety of methods to tell you what it wants. In particular, they often convey their wishes using body language. The more involved you are with your dog’s life, the more you will understand their unique communication techniques: you will begin to interpret the meaning behind the positioning of their ears and tail, for example. All of these things mean that dog training creates a happy environment for your canine family member, and this has positive connotations for the entire household. A trained dog means a happier dog and household, in other words. Teaching a dog to heel is a very useful command as it can drastically improve the walking experience you have with your canine companion. It is particularly useful when you are out exercising your dog in crowded places or sidewalks, or in the company of other dogs or animals in general. It is common practice for trainers to teach on-leash heeling to a dog, but correcting a dog in this way and only this way prevents them from enjoying the reward of obedience. It is much like the carrot or the stick analogy: teaching your dog to heel simply by pulling hard on their leash and nearly choking them is a very ugly stick, and even though they might stubbornly obey, you can never gain the confidence you get in knowing that your dog actually obeys out of love, and not fear. Plus, when you teach a dog to heel in this way, you can never feel entirely at ease when you take the leash off. They might be compliant when you have the power to pull their leash, but what happens when it’s removed? You cannot guarantee compliance with the lease removed since you never bothered to perfect this aspect of heel training. Dogs are fiercely intelligent, and they can discern the helplessness you feel when you let them off the leash if you live by it. If you really want to take dog training seriously, and dedicate yourself to it wholeheartedly, you need to learn how to teach your dog to heel without a leash. Now, before you panic, it’s important to understand that this step is just one step in the entire process. Yes, in the end, you will be able to put the leash back on. Yes, you will be able to tell them to heel when on the leash. The essential difference is that you won’t have to pull on the leash in order to get them to obey. When you follow the entire process, and stay consistent, you can walk your dog with a long, loose, comfortable leash, and as soon as you give the command, they will be right by your side before you can click your fingers. Start the training in a familiar environment with no distractions. Command the dog to sit or stay. Stand by them for a while: make sure things are calm and they understand this before proceeding further. Have treats ready: keep them in your pocket. Make sure the dog stays while you walk very slowly forward. Then, slowly but surely, allow them to proceed calmly by using the treats to guide them forward in alignment with your pace. Combine the treats with verbal praise every few steps. If they stray or get distracted, start over again by calling their name and getting them to sit. Repeat these steps regularly and consistently until your dog fully comprehends the command. Once your dog masters the off-the-leash heel command in a safe and familiar environment, you can expand your horizons. 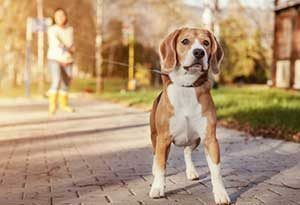 Depending on your relationship with your dog and where you live, you might feel confident enough to try the heel command off-leash when you’re walking them. If, however, you’d prefer to use a leash, that’s no problem at all: just make sure you bring your treats and maintain the consistency of the heel command. Never use the leash to punish the dog. If they disobey the command when you’re out on a walk using the lease, just treat it exactly the way you would as if they were off it. Be calm, hold the leash loosely, and get them back into the sitting position before trying again. Try and try again. This is the number one thing to remember when dog training, however: Don’t give up!